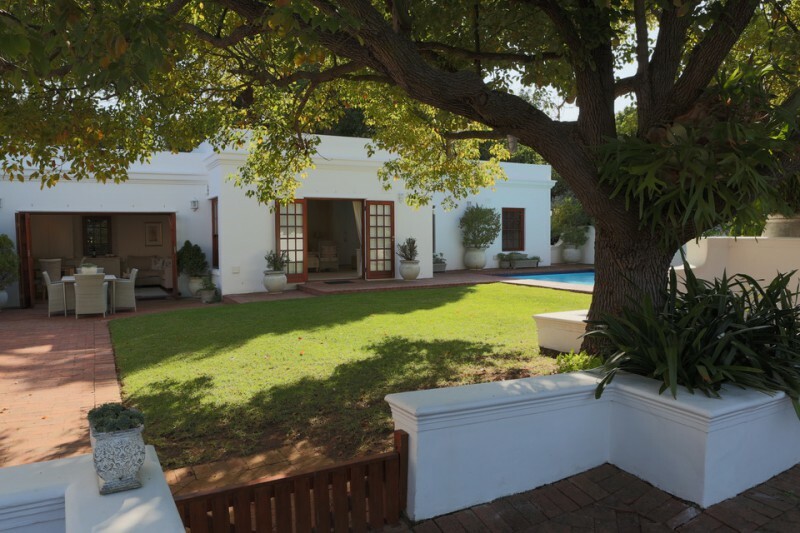 Situated in one of Cape Town’s most exclusive suburbs, Constantia Garden Suites offers unique luxurious self catering accommodation. 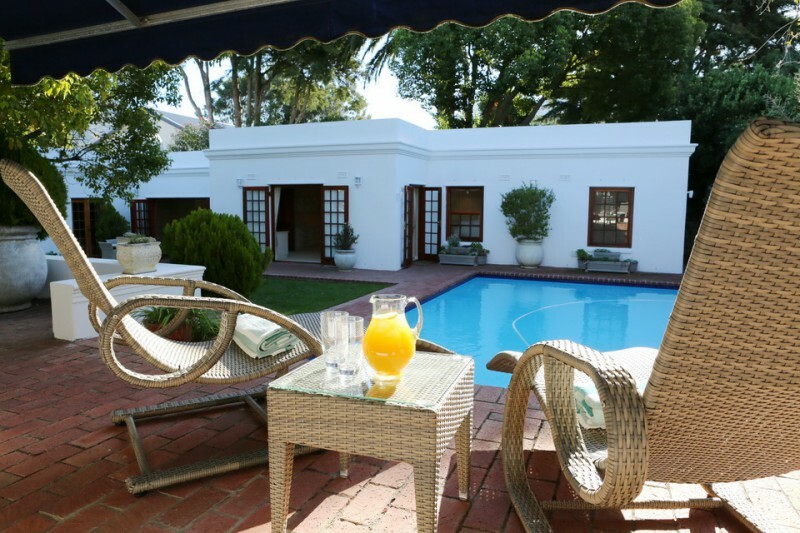 Suitable for two adults (no children or infants) The Poolside Apartment offers exclusive use of a manicured garden, full length salt water pool, pool deck for sundowners, and an exquisitely furnished 85 sq metre (915 sq ft) apartment. 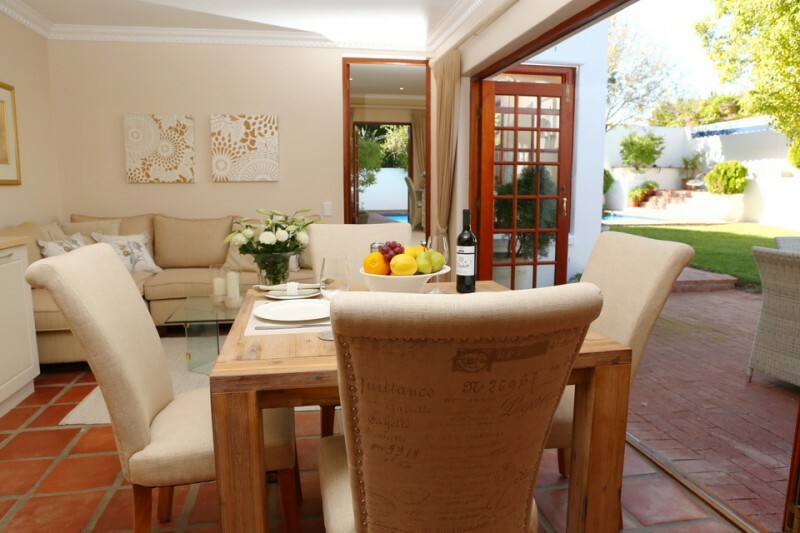 The apartment offers a very spacious bedroom, exquisite en suite bathroom as well as a dining area, kitchenette and relaxed seating both indoors and outdoors. 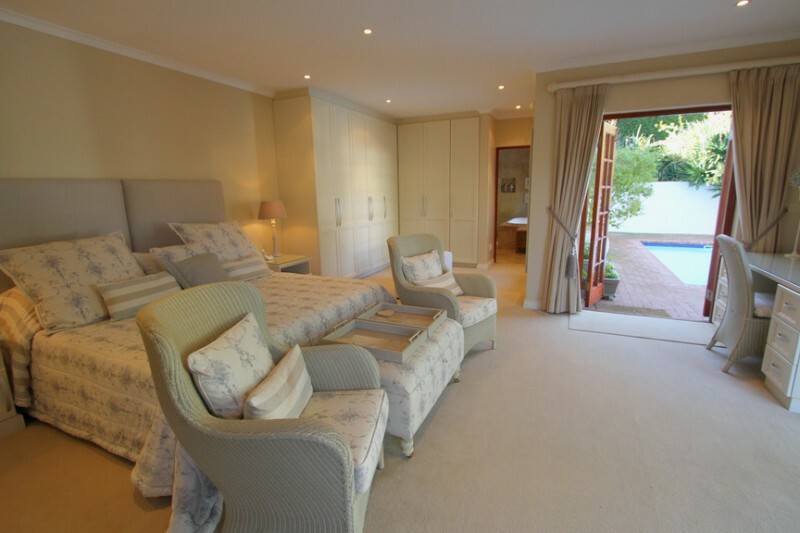 French doors open from the bedroom to the pool and garden, where you can relax and enjoy the ambiance of the property. 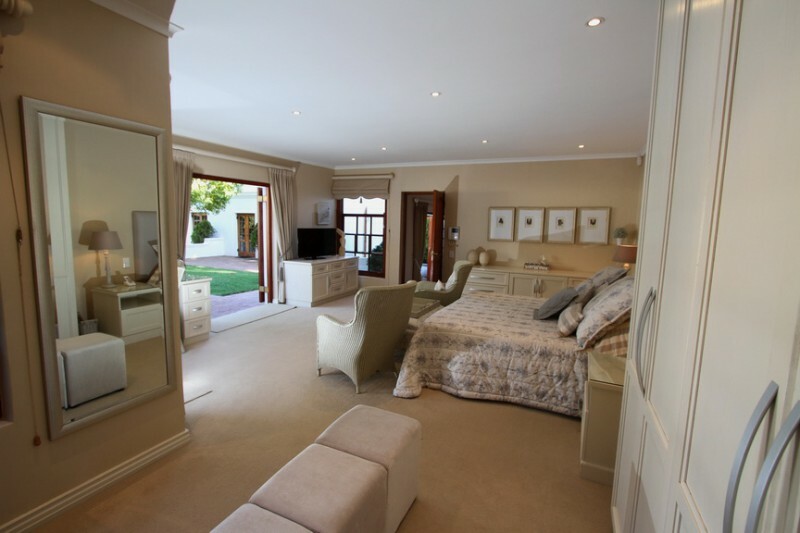 The luxurious bedroom boasts an extra length king sized bed which can also be made up as two twin beds. All linen is pure combed Egyptian cotton with non-allergenic duvets and pillows. The dressing area which has French doors opening onto the pool area is equipped with hairdryer and other essentials. The bedroom has a flat screen TV with full satellite DSTV and comfortable seating, which makes a perfect area to catch up on the day’s news or watch a movie. Free Wifi access ensures you keep in contact with business or loved ones. 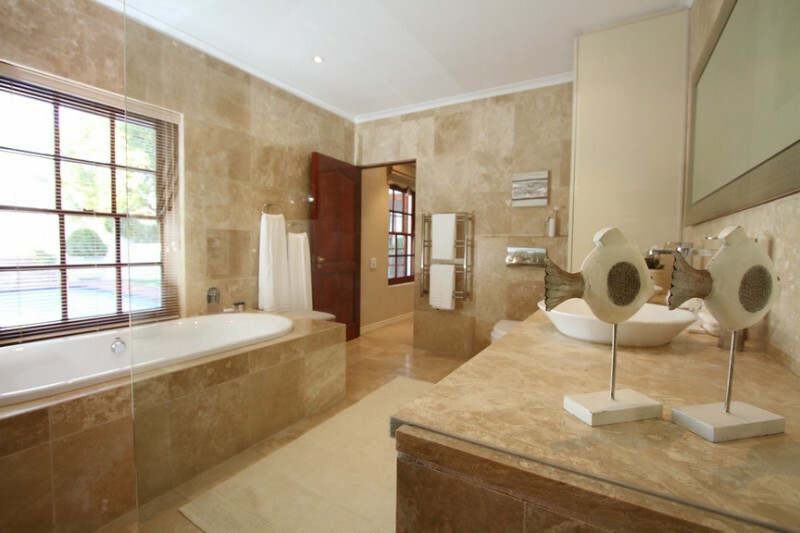 The spacious en suite bathroom has a full sized bath, walk in shower, his and hers vanity basins, lots of cupboard space and a view of the pool. Heated towel rails, top quality towels and complimentary toiletries on arrival ensure a pampered experience. 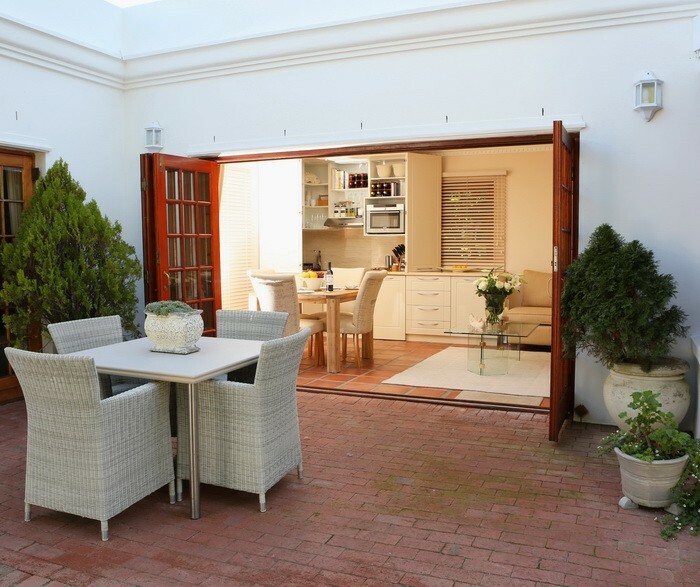 The lounge / dining area has sliding doors that open completely onto the garden and patio area, where there is an outside seating area under a retractable shade awning. 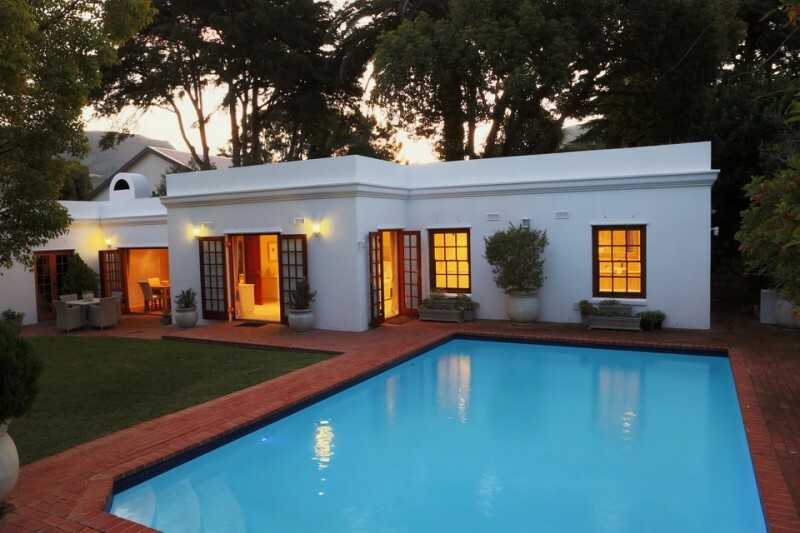 We offer traditional South African braai (barbeque) facilities on request. The pool deck has sun loungers and partial views of the surrounding Constantiaberg Mountains and is a perfect area for basking in the sun during the day, evening sundowners or relaxing with a bottle of wine. Light, airy and luxurious, the apartment has been designed to pamper the most discerning guest whilst retaining a home from home atmosphere. There is secure off street parking for one car under shade. Access to the property is via electronic gates. There is an electronic safe for storing valuables and the property is fully alarmed in case of emergency. There is an intercom between the apartment and the owners who will be happy to assist during business hours and give advice on local attractions etc. 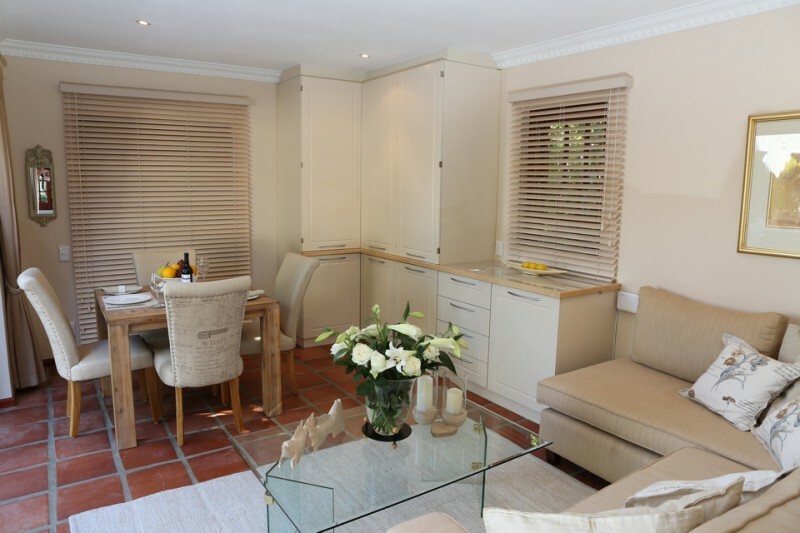 The kitchenette provides the flexibility to make your own breakfasts, light meals, TV dinners and refreshments. There are many world class restaurants, wine farms and eateries close by and we are also happy to recommend excellent local home delivery services. High quality pots, pans, braai equipment, cutlery, crockery and glassware. The apartment is fully serviced 5 days a week at no extra charge and we encourage guests to relax and make use of this service. Service on weekends and public holidays is by prior arrangement as is a laundry service both of which are at an additional cost. There are excellent shopping facilities within 2 km offering an extensive range of local fresh produce, convenience foods and groceries as well as many services such as hairdressing and dry cleaning. The entire apartment is climate controlled by underfloor heating for the winter and soft freestanding fans for the summer. Facing East, the property escapes the harsh afternoon sun and the apartment is flooded with morning and mid day sun. The pool deck area faces west for those who love the sun in the afternoons and has an awning for shade during hot summer days. 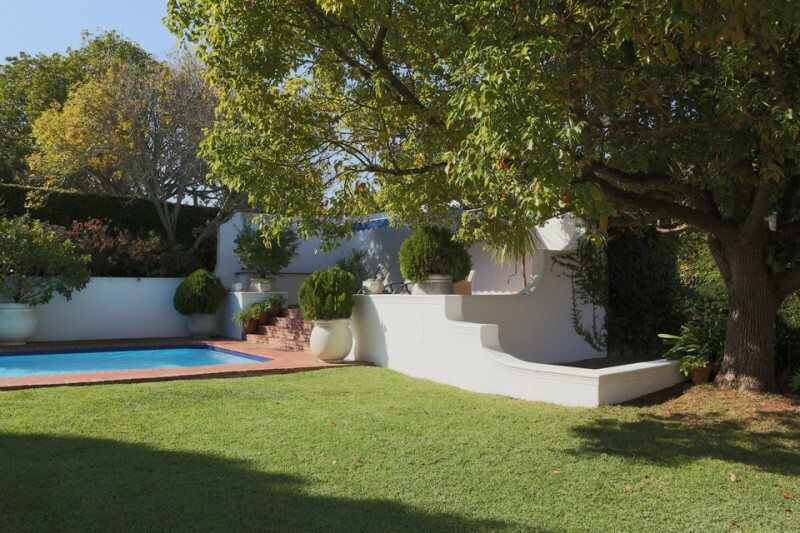 The sparkling salt water pool is full length (9 metres X 5 metres) and ideal for a morning swim, to cool off during the heat of a summer’s day, or to luxuriate in on a warm starlit night. The pool is exclusively for your use only. We believe that this venue offers both international and local tourists, as well as the business traveller a unique and welcoming stay in one of the country’s most desired locations and look forward to welcoming you.